As soon as I can I will be back to posting my usual daily outfits. Until then I hope you enjoy the little break and slight change of format. First up, talking about my pregnancy wardrobe and the maternity pieces I wore through my pregnancy. I had a total of 14 maternity pieces to supplement my existing wardrobe. I've included links below so you can see when I wore them, and how often I wore them. My goal was to buy as little maternity pieces as possible. Jeanswest 'Felicity' maternity shirt in amethyst. Worn in third trimester, three times. 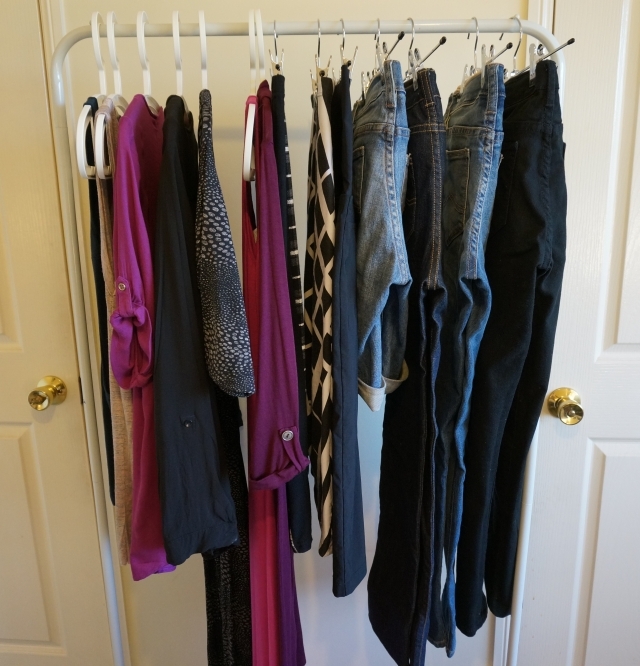 I was lucky to have a lot of pieces in my existing wardrobe that worked well in pregnancy. Lots of flowy, loose, oversized and stretchy pieces meant I didn't need much maternity wear. I'll do a follow up post about the non-maternity items I found most helpful. Maternity tops I found tricky to wear as the extra length swamped my petite frame. Dresses were the easiest, most comfortable maternity wear option for me. Great go-to pieces! The Asos maternity pencil skirts I bought were fantastic for work and I'd recommend them to anyone who has to dress for pregnancy in the office. Jeanswest maternity denim is the only brand of maternity jeans I tried - perfect first time so I didn't try to look elsewhere. I hope that you found this post useful, and that you can pass it along to anyone who might benefit from it :) Different from my usual posts, but I thought that laying out what I wore and how I wore it during my pregnancy might come in helpful for someone. Linking up with Manic Monday, Style Sessions, Three-Fer Thursday today. I've just seen your Instagram, congratulations on his safe arrival! I agree re: ASOS maternity pencil skirt, mine has been really useful for work so that I still feel smart enough without compromisin on style. Loving the pieces of your pregnancy wardrobe :) Pretty much loved ALL your tops! :) And of course, the maxi skirts. Didn't suspect those would be easiest to wear! I am totally saving this post to refer back to someday. Great tips. Hope you are well! Can't wait to hear baby news. Mica, you did a fabulous job dressing while pregnant. Always stylish. Loved you in maxi dresses and skirts. Congratulations doll! Kisses to the new addition and Cooper. Yay congratulations!!!!! Can't wait to see a photo :-) Also so lovely that you've done this, you have impeccable style girl! Congrats on the baby - I'm so happy for you!! YAY!!! I'm so so happy for you! Can't wait to see you and baby. Congrats to you and hubby :) You looked so beautiful all throughout your pregnancy. Thanks Rosemary! :) I'm definitely very lucky to have been able to use lots of my existing wardrobe. Meant I needed less maternity clothes and could spend more money on baby clothes haha!